The E-Commerce portal where clients of John Harlowe's Moonlight Engineering Automotive Fabrication and Design Company can render their account payments for service contracts and commissioned product designs. These Autofuse (TM) ATO/ATC fuse holders are manufactured with Delphi Packard (TM) sealed connection components that are designed to withstand moisture, temperature extremes [ -40 ? F to 260 ? F ] and engine compartment fluids. 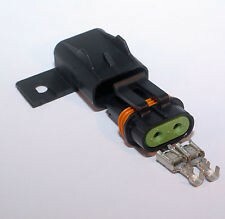 Even in the harshest environment, the multiple ribbed silicone rubber seals under the latching cap and around the wires, along with the heat and impact resistant nylon fuse body and cap combined with the Metri-Pack (TM) contacts [ 46 Amps at 16 VDC ] provide the highest circuit reliability. 12066614-16 is the complete fuse holder with a 12 inch long [ looped ], 16 gauge SXL automotive stranded copper primary wire with a solid RED Polyethylene insulator rated to 257 degrees F.
All you need to do is to cut the loop [ cutting the loop in half will give you 2 six inch leads ], terminate the leads with the connector of your choice, put in a 20 A fuse and connect the fuse holder assembly in series to the circuit power supply wire. If you would just like to purchase the standard fuse holder with the red 12 inch wire, then leave the SELECT drop downs as they are, otherwise, select your length and or color. Free Shipping on orders $50 dollars and over. During checkout, you must select either USPS Flat Rate Domestic or USPS Flat Rate International as the shipping method to qualify for Free Shipping. 12066614-14 is the complete fuse holder with a 12 inch long [ looped ], 14 gauge SXL automotive stranded copper primary wire with a solid RED Polyethylene insulator rated to 257 degrees F.
All you need to do is to cut the loop [ cutting the loop in half will give you 2 six inch leads ], terminate the leads with the connector of your choice, put in a 25 AMP fuse and connect the fuse holder assembly in series to the circuit power supply wire. 12033997-12 is the complete fuse holder with a 12 inch long [ looped ], 12 gauge SXL automotive stranded copper primary wire with a solid RED Polyethylene insulator rated to 257 degrees F.
All you need to do is to cut the loop [ cutting the loop in half will give you 2 six inch leads ], terminate the leads with the connector of your choice, put in a 30 AMP fuse and connect the fuse holder assembly in series to the circuit power supply wire. The AUTOBLUEPRINT shopping cart uses PayPal at checkout. You may use any of the payment options listed above through PayPal when making your purchase at AUTOBLUEPRINT.